Senior quarterback Dylan Bradford fully extends towards the pylon in one of his two rushing touchdowns in West’s victory over Wellston, 35-0. The Portsmouth West Senators defeated the Wellston Golden Rockets Friday night in West Portsmouth, 35-0. On Friday evening, the Wellston Golden Rockets traveled to Portsmouth West to take on the Senators. The Senators entered the game a perfect 3-0 while the Golden Rockets arrived 1-2, looking to get their season back on track. Starting off the first half, the Golden Rockets would receive the opening kickoff. Operating their offense with a slow tempo running game, Wellston would use the first six minutes of the game clock to slowly rush into opponent territory. 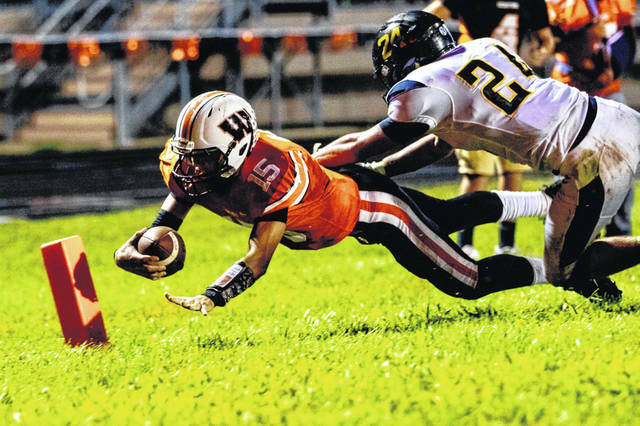 The drive would end with the Rockets facing a 4th and 13 as Wellston quarterback R.J. Kemp threw a jump ball into the end zone that would be broken up by the Senators, causing a turnover on downs. The Senators first drive of the night would only last three plays as a result of two incomplete passes and a short run gain, forcing a West punt on 4th down. 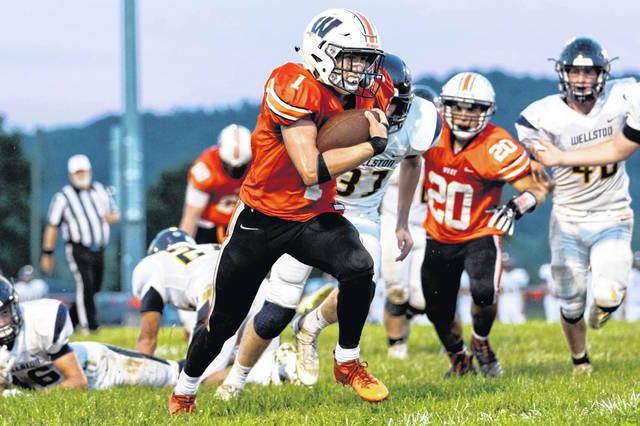 Wellston’s second drive would run into trouble as on the fifth play, West senior linebacker Cole Staggs would force a fumble that the Senators would recover on their own the 39 yard line. This would prove to be a massive momentum swing as the very next play West quarterback Dylan Bradford would find a wide open Josh Berry for a 39 yard touchdown pass for the Senators. The Golden Rockets miscommunication on defense resulted in a blown coverage by the secondary. West would take the lead 7-0 after the converted extra point to end the first quarter. After a Wellston punt on their next possession, West would be back in control of the ball looking to extend the lead. With 8:30 left in the second quarter, senior running back Garrett Hurd would fumble after a seven yard reception across the middle, recovered by the Golden Rockets at midfield. Wellston struggling to establish a passing attack early in the game would be costly. On an important 3rd and 12 in opponent territory, Kemp would drop back to pass, scramble to the left looking for an open receiver, and ultimately be taken down for a seven yard sack by defensive end Sid Shifflet. This would force the Golden Rockets to punt once again. With only four minutes of play left in the first half, Portsmouth West would cover 80 yards in their next six plays with contributions from Dylan Bradford, Garrett Hurd and capped off on a twenty yard touchdown scamper from fullback Cole Staggs to give the Senators a 14-0 lead heading into the half after the successful extra point. The Senators would receive the ball to begin the second half, hoping to put the game out of reach. West had no trouble moving the ball down the field on the first drive of the second half. From the 13 yard line, Bradford would take the snap, scramble to the right side of the line of scrimmage in a foot race to the pylon. He would gain an edge with a fully stretched leap into the end zone for a West touchdown. The extra point conversion would give the Senators a 21-0 lead with 7:30 to play in the third quarter. The next two Wellston drives would both result in three plays and a punt, as the West defense remained dominant in the 3rd quarter. Just a minute and a half into the 4th quarter, Garrett Hurd found the end zone on a two yard half back dive for his first touchdown of the game. Hurd was also kicking the extra points Friday night as he hit another PAT, giving the Senators the lead 28-0. Another Wellston turnover on downs would setup the Senators to chew the 4th quarter clock to seal the game. A one yard QB sneak touchdown by Bradford would bring the running clock and a successful extra point would give the Senators a 35-0 victory over Wellston. The Wellston Golden Rockets fall to 1-3 on the season as they will host the Alexander Spartans at 7:00 p.m. next Friday. As for the Portsmouth West Senators, they improve to 4-0 on the season and will be at home against the Raceland Rams next Friday at 7:00 p.m. in what will surely be a dog fight of a game.